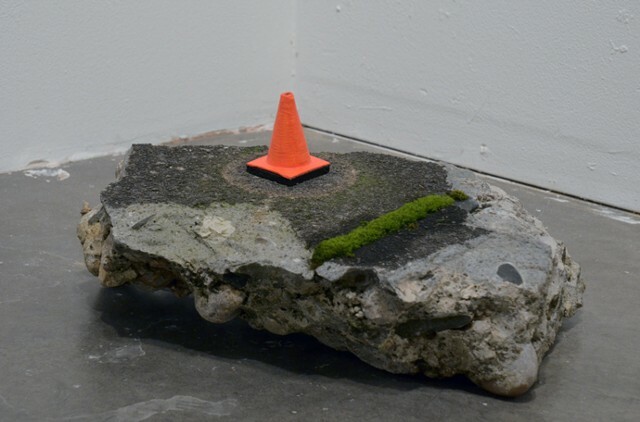 A fabricated replica of a traffic cone sits in the middle of a golden halo on a drifting piece of concrete with living moss. The traffic cone is overly visible within the contemporary urban environment to the extent where its meaning has become obsolete. The "alert" signal or "boundary" indication for which this symbol is known is shed and what is left is a question. This piece is an investigation of self using the impersonal "character" of this cone on its journey to discover its true purpose.